Remember waaay back before school started, I took a Lynne Vogel workshop? 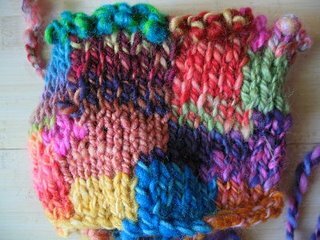 The theme was Spinning for Knitting Color, the result was (as with every Lynne Vogel class) to have my little grey cells shuffled like cards. And yes, it was as mellow as this photo seems. 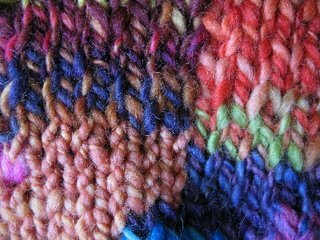 I have only a couple of knitted samples, but the concepts that she taught around the knitting have me hunched over my spinning wheel like Gollum on the trail of my precious colorways and dreaming of drum carder. We did a bit of intarsia. Retarsia in my hands. tried to make them balance out in grid. I'd like to add that I'm 43 years old, have been taking knitting classes for 10 years & have just recently had this knitting class revelation. Now I only use worsted or fatter in classes - Brown Sheep is my favorite. Enterlac was up next. Which I quite liked except for the flaccid five - those stitches to use when doing side triangles. 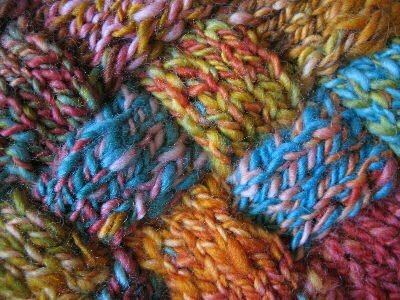 This bit was done with some of Spunky Eclectic's BFL roving in the Aztec colorway, plied onto itself. 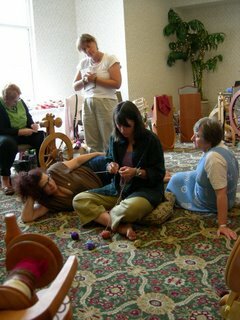 We did color blending by carding and color blending by plying -I've got some projects going that I'll show sooooooooon. um! yes! i've been waiting for pitcures! they are making my heart pitter patter. Gorgeous colors. Must try entrelac soon. I can hardly wait to see those other projects! There is no way you are 43 years old. Maybe 33, but not 43. I demand to see proof. 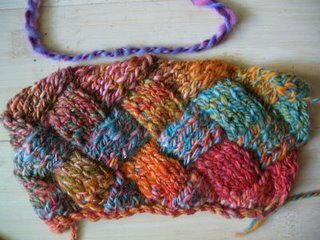 I love that entrelac. I've never been interested in trying it before but those colors and that yarn make me want to do it nooowww! Thanks for posting about the class. I have been meaning to, but don't have to now! LV is my personal diety.